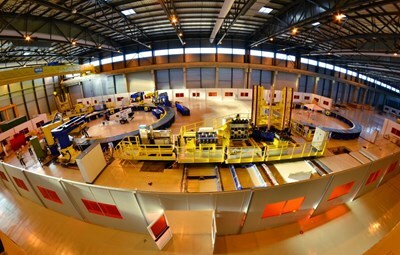 ITER's ring-like poloidal field coils are among the largest and heaviest components of the ITER machine. 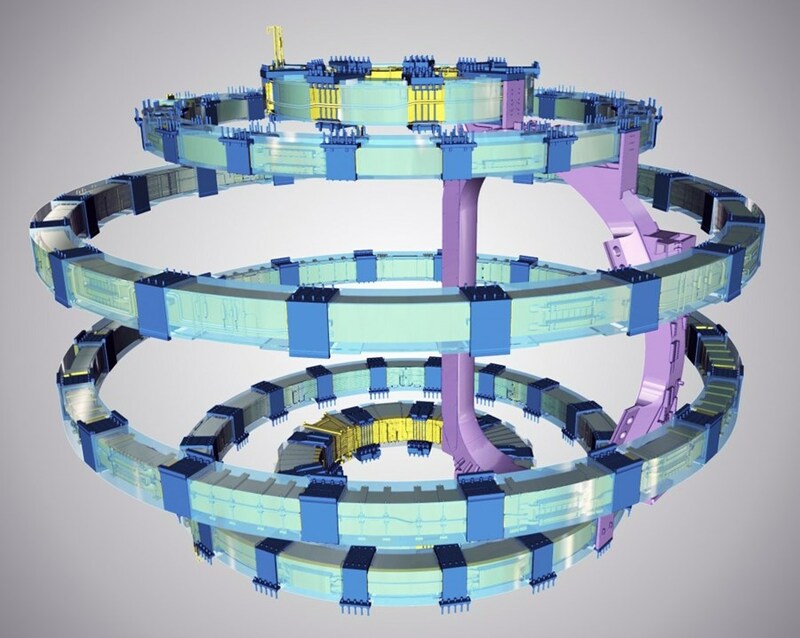 Ranging from 8 to 24 metres in diameter, and from 193 to 396 tonnes, six coils will encircle the ITER vacuum chamber like so many parallels of latitude to influence the shape of the plasma and contribute to its stability by "pinching" it away from the walls. Reels, de-spoolers, a winding table, impregnation moulds ... little by little the 12,000 m² Poloidal Field Coils Winding Facility is being equipped with specialized tooling. 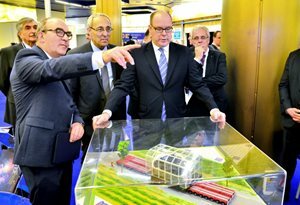 If the top and bottom coils (see image below) are small enough to be produced off site and transported to ITER, the size of the four others precludes any transport by public waterway or road. 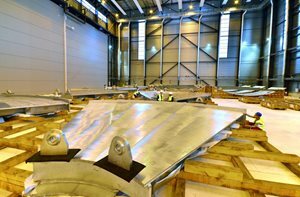 For these massive machine components the European Domestic Agency has built the on-site Poloidal Field Coils Winding Facility, a 257-metre building with 12,000 metres of surface area and a circular spreader beam overhead for handling the components during the assembly process. On the southern end of the building, contractors are currently installing specialized tooling—reels, de-spoolers, a winding table, impregnation moulds. 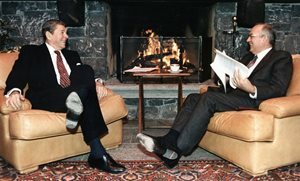 When taken together they reflect the monumental scale of the undertaking and the complexity of the procedures. Six poloidal field coils, ranging in diameter from 8 to 24 metres, will encircle the vacuum vessel to shape and stabilize the plasma. As they come off the spools, the lengths of poloidal field conductor will be straightened, cleaned, insulated with glass-fibre tape, and finally wound into spirals called double pancakes. Weighing 16 to 35 tonnes, these double pancakes are transferred to another station for vacuum pressure impregnation (VPI) with epoxy resin in order to harden into rigid assemblies. In a third area, six to nine double pancakes will be stacked and joined to form the final coils. A second VPI procedure is performed to harden the stacked assembly and additional components added such as clamps, protection covers, and pipes are added. 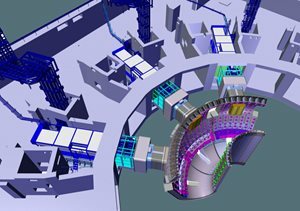 The coils will undergo approximately three months of electric and cryogenic testing before transport to the Assembly Hall—the last stop before integration into the Tokamak arena. As Tokamak assembly advances, the poloidal field magnets will be positioned one by one in the Tokamak Pit beginning with #6 (produced by China under contract with Europe), followed by poloidal field coils 5, 4, 3 and 2 (fabricated by Europe), and finally coil #1, manufactured and delivered by Russia.